As a young mother facing a terminal diagnosis, Julie Yip-Williams began to write her story, a story like no other. What began as the chronicle of an imminent and early death became something much more--a powerful exhortation to the living. 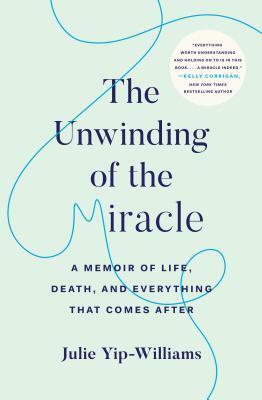 The Unwinding of the Miracle is the story of a vigorous life refracted through the prism of imminent death. When she was first diagnosed, Julie Yip-Williams sought clarity and guidance through the experience and, finding none, began to write her way through it--a chronicle that grew beyond her imagining. Motherhood, marriage, the immigrant experience, ambition, love, wanderlust, tennis, fortune-tellers, grief, reincarnation, jealousy, comfort, pain, the marvel of the body in full rebellion--this book is as sprawling and majestic as the life it records. It is inspiring and instructive, delightful and shattering. It is a book of indelible moments, seared deep--an incomparable guide to living vividly by facing hard truths consciously.